Here is my 2015 Home Haunt video. Hope you enjoy! Grimlock Manor 2015 Haunt Video. 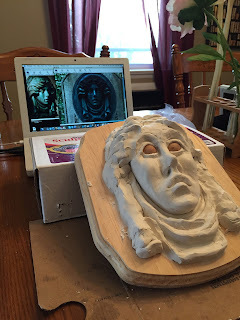 So I just posted about over analyzing your art and in that post I spoke about a project where I did just that, my Madame Leota Sculpt which is going to be used for my Madame Leota Tombstone prop this year. 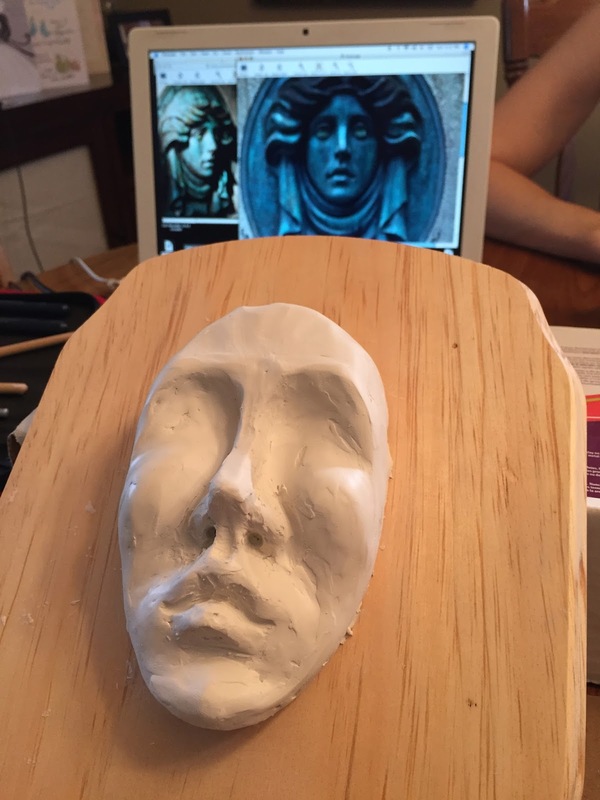 I wanted to post some pictures of the beginning stages of the sculpt so you can see the process. You will see where I started then kind of peeled back and re-started and where I am with it right now. The 2 biggest issue I was having with it were the eyes and the hair. I eventually went out and bought some wooden balls from a craft store to place in as the eyes and work around and I have found it has helped tremendously however, the eyes are still slightly too close to one another. 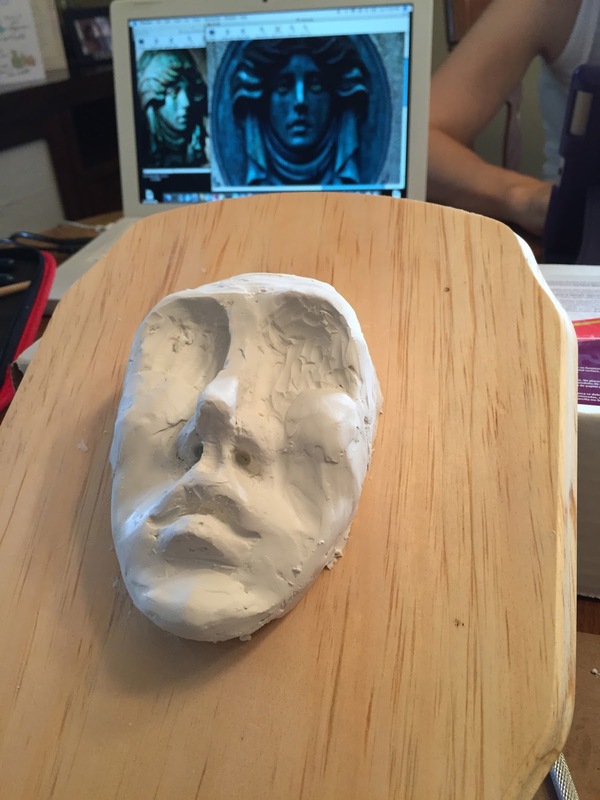 I pretty much left it as is and continued to push forward with the sculpt. The hair was my other issue. I keep looking at it from all angles and am trying to get it to match the reference picture the best I can. I think I left it in a place where I am starting to like it but I still have some ways too go with it. My set up is not the best but I am learning a lot with this one as I move along. I was hoping it was going to make it into the 2015 display but I started it a bit too late. The goal is to finish the sculpt and mold and cast this in a lightweight resin which I can mount on the tombstone I make for her. 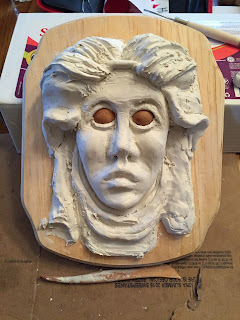 Leota's stone has moving eyes at the actual attraction but my prop will just be a static prop. I may fool with the idea of creating a projection of moving eyes because it's within my comfort zone to give that a try but with many other prop build on my list for 2016 it may have to wait. If you have any questions with what you see please let me know and I will do my best to answer them. I am no prop and simply at a novice level but I am happy to share what I have done to this point and what has worked and not worked thus far. I hope you enjoy these initial pictures and as I progress up to the final look I will continue to share all the progress. For some time now I have wanted to give sand casting a try. 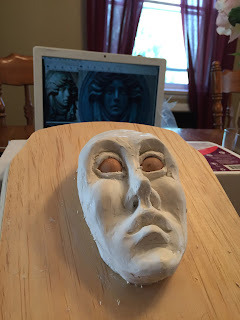 I first learned about sand casting in the book series created by Lynne and Shawn Mitchell How To Haunt Your House . I had received the first issue of the series as a Christmas gift some years ago and while flipping through it I came across the sand casting tutorial and thought how fun and useful it looked to be especially for casting smaller items. 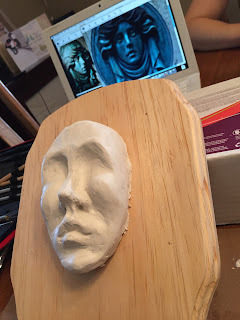 Fast forward to today and I finally decided to give sand casting a try and I am glad I did! The catalyst for me to finally try sand casting was when my daughter received Kinetic Sand as a gift. 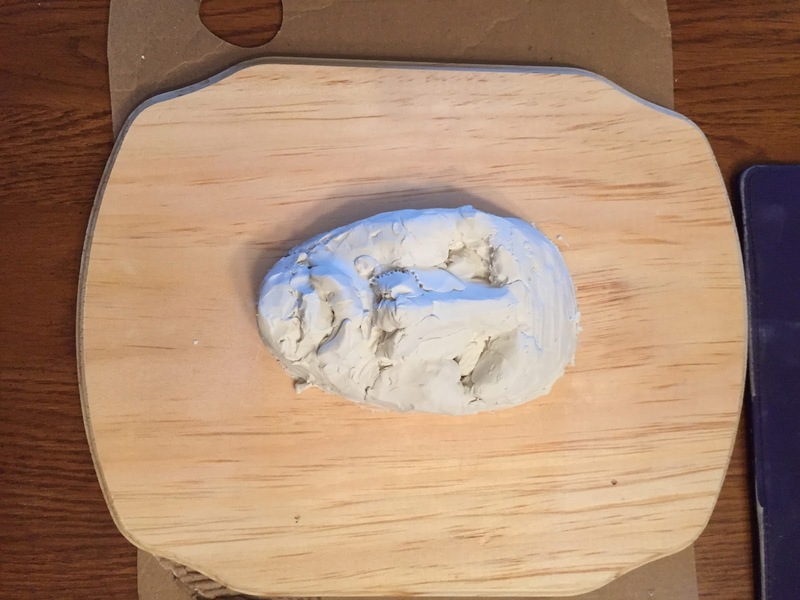 The Kinetic Sand doesn't require water, holds it shape very well, and does not stick to anything. After playing around with it for a bit the light bulb went off in my head to give it a try and use it for sand casting. 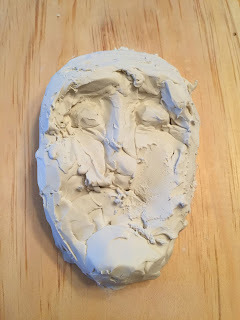 I won't go into great detail about the process because you can easily look it up on line or check it out in the Mitchell's book but the gist of it is to find an object you want to make a casting of, press it into the sand to get the impression of the piece and fill the impression that has been left with hot glue. Once the glue dries you are left with a casting of the piece. I choose a small baseball sized skull I had lying around and pressed it's face into the sand. 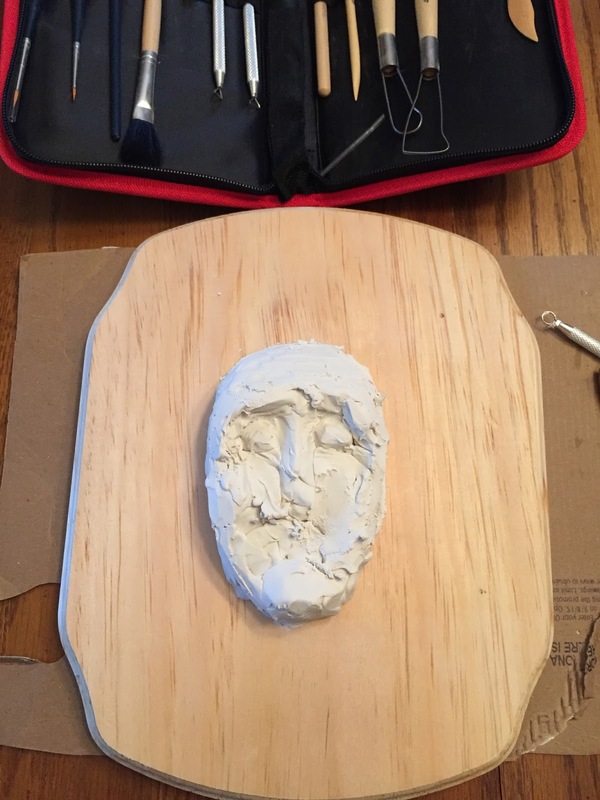 It took about 3-4 glue sticks to fill up the void left behind and ensure that the glue filled it up fully and evenly with the sand leaving the back of the casting nice and flat. I would say about 2-3 minutes later the glue had cooled and I pulled the casting. 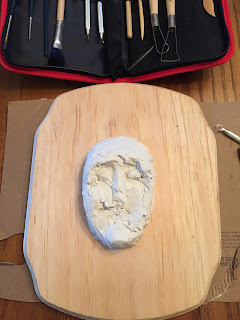 Originally I had thought that maybe the kinetic sand which normally does not stick to anything would not stick to my casting but there was some slight clean up. I simply used a wood skewer to clean out the sand as best I could then ran the piece under water to get any sand that was left over off. It took a little time but the results (in my opinion) were well worth it. 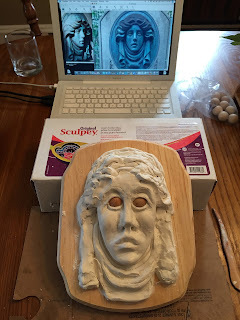 I made two sized skulls with this method and while neither were perfect representations of the original they were good enough for my intended uses on tombstones and my future mausoleum build. I gave them a quick paint job each by using a base of acrylic black paint then a dry brush of white over top for a stone look. 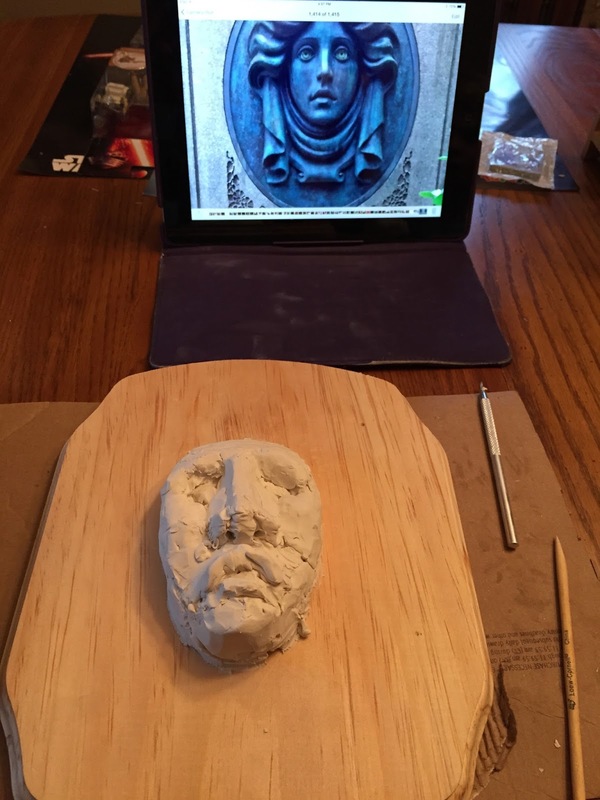 Overall I would say sand casting is an enjoyable and easy process best served for small items that you may need a few multiples of. Larger castings aren't out of the question but you would have to test melting large portions of glue sticks in a pot for some fast pours because the time it would take to fill up a sand casted mold from a hot glue gun would take more time than this haunter thinks it would be worth. I would be interested to see what other casting materials could be used using this technique like resins perhaps or various types or rubber or silicone but for the time being hot glue works for me. I would definitely suggest giving this a try. Even if you don't have anything you really need to cast up at the moment it is still a fun craft to do. If you happen to give this s try or try other methods please let me know in the comments below and attach some pictures for us to see. 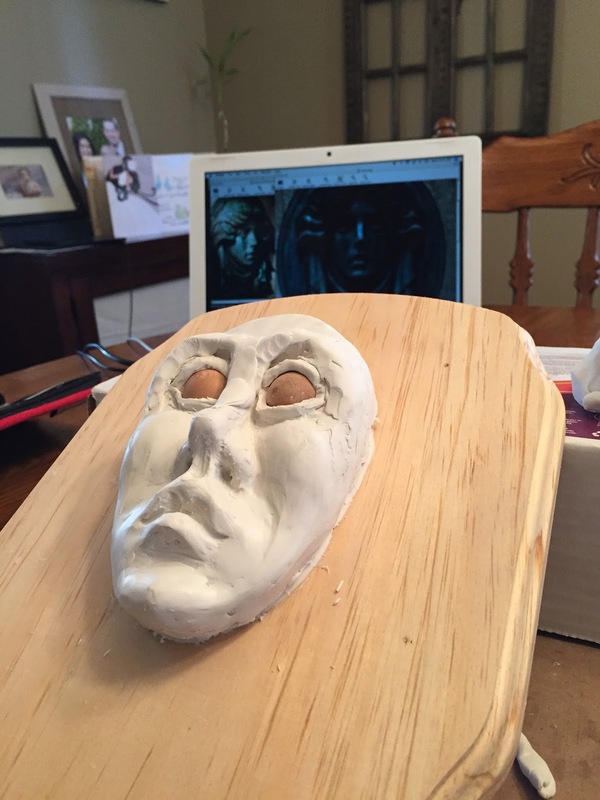 Have fun with it and now on to the next creepy creation for the 2016 Haunt Season!